I’ve always enjoyed a decent yogurt. I’ve tried all different flavors from all different brands. I have complaints about some – I don’t like fruit on the bottom because I feel it makes the yogurt a lot more liquidy than I would like, and I have some tried and true favorites – Activia’s vanilla is to die for. When I went on my first deployment, I had ample amount of time to surf the internet. That’s when I became interested in health. The first book that caught my attention? French Women Don’t Get Fat. There was something about it – something different. I had never heard of some of the items in that book and that’s probably what stemmed my curiosity. The first item that I had never heard of? Greek yogurt. I had never heard about this type of yogurt, and at the time being in another country, I wasn’t able to go to the store and buy it… but I definitely sampled some when I returned home. Fage was the first. It was the brand mentioned in the book, so I had to try that one. It tasted like sour cream – which I am definitely not opposed to, but it’s not ideal to grab a sour cream flavored pack out of the fridge to snack on. 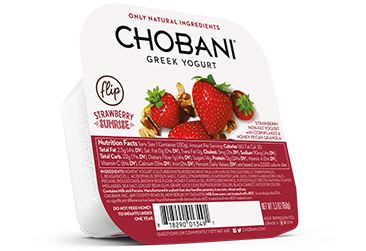 So, my journey began with sampling all different flavored Greek yogurts, but they all have way too much sugar and there was always something missing…and then they came out with Chobani Flips. I purchased every type again so I could do a review on them – I’ve had some of these in the past and some are brand new to me! I was a little iffy about trying this one again. The first time I had tried it, it had chia seeds and hemp seeds – I wasn’t a fan. I felt as though the seeds overpowered the blueberry and spread all over my mouth. They’ve since taken the hemp seeds out and replaced it with sunflower and pumpkin seeds. I think it’s a great improvement, but I still can’t eat this in public. The chia seeds get all stuck in my teeth and it’s very unpleasant. However, the overall score of this? Probably a 3 out of 5 – because while it is still good, I have plenty more which are my “favorites”! This was a new one for me – actually, I think it’s the newest addition they’ve came out with. Well, a little background, shortly after I came home from my deployment, my mother and I went to New York City for the weekend. 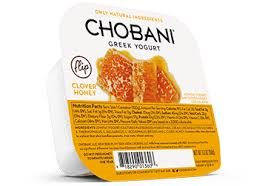 One morning for breakfast, I ordered Greek yogurt and honey and fell in love. First off, I’m the biggest fan of honey and second, the combination of the two of them is just out-of-this-world delicious. This one is amazing, but the only thing it’s missing is the “crunch” factor that every other one has in it. For that reason – I’m going to be giving this a 4 out of 5. I’m a huge fan of tropical flavors – coconut, pineapple – you name it, I probably love it – so I thought this one was delicious. I loved the fact that this one had toasted coconut as an add-in, because the texture just improved with the fact that it was toasted. However, I assumed from looking at the packaging that it was going to taste like a pina colada or at least have a bit more coconut flavor to it. I’m a huge coconut fan, so it was a little disappointing. This one gets a 4 out of 5 in my book, but if you don’t like the texture of coconut, you will probably be unimpressed. This one is probably my least favorite out of all of them. Maybe it’s because they the strawberry was just too tart for my liking or maybe it was because the addition of corn flakes into my yogurt caused the cornflakes to lose their “crunch” and take on a semi-soggy state. I suppose if I were to have power-house ate these, I wouldn’t have the problem of soggy cereal in my yogurt, but I tend to be a very slow-ish eater, so this didn’t work out in my favor. I did, however, love the addition of pecans in this – I’m a huge pecan fan (I’m a huge fan of a lot of food, if you couldn’t tell). I give this one a 2 out of 5 because while it may be a favorite to most, it just wasn’t mine – there wasn’t anything particularly wrong with it, it just wasn’t a favorite. This one is amazing. 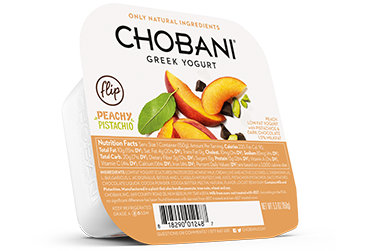 I love peach flavored yogurt and this one even has the occasional peach chunk in it. The addition of the pistachios and dark chocolate make for a sweet/salty snack, which I know many people love, and the other combinations lack. This is one of my three favorites. I rate this one 5 out of 5 because there’s honestly nothing I would change about it at all. I honestly loved the concept of this one. I love the flavor of bananas with yogurt, especially when they are supremely ripe and have that wildly strong banana flavor. However, I was a little disappointed in the banana flavor with this one. I didn’t feel it was strong enough and compared to the rest of the flavors, it fell a little short. I imagined being “wowed” with the banana flavor. Don’t get me wrong – it was still good! It definitely got a 3 out of 5 because I loved the chocolate, almond, and yogurt pairing – even if I couldn’t taste the banana. Can I tell you how much I love just a plain old vanilla yogurt. I could eat this without the add-ins (but who would want to do that, when we all crave that “crunch”) I wish this didn’t have the cornflakes in it and just had thick pecan granola clusters. The cornflakes, once again, dropped this down a little more than what I would have rated it if I didn’t feel as though I was eating partially soggy cereal. However, it still gets a 3 out of 5 because of the vanilla flavoring. Yum. Okay, this one is number two of my top three! (Saving my absolute favorite for last.) I think my favorite dessert my be a key lime pie. 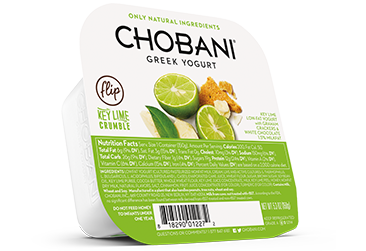 I love the sweetened graham cracker crust – with a creamy, tangy key lime custard center – which is exactly what the yogurt has – and the addition of white chocolate chips just puts it over the top. This might be the epitome of a “dessert” yogurt. I think I would like to see an addition of lemon meringue pie in these Flips future…just saying. I rate this one a 5 out of 5 because, honestly, who wouldn’t want to eat this one? This was the first of the Flips yogurts I tried. I mean, why wouldn’t I? It’s coconut with chocolate. The yogurt is spot-on with the coconut flavor and the add-ins that they chose with these are amazing. 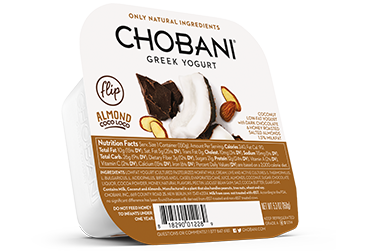 It’s like you’re eating an almond joy candy bar in the form of yogurt. Dark chocolate with slivered almonds mixed into a creamy coconutty yogurt. This one is by far my favorite and a favorite with the co-workers as well (you’re bound to see one in the fridge every day because someone’s brought it in addition to their lunch). I obviously give this one a 5 out of 5 due to my raving about how delicious it is. Have you sampled any of these flavors? Which are your favorites? 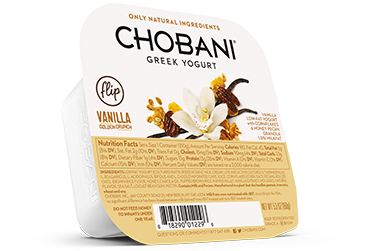 Also – if you could create any “flips” yogurt, what would you create? Supply a name, a yogurt flavor, and the add ins! I may take some of the creations and make them (plus supply a recipe!) I think my creation (because of it being autumn and all) would be “Pumpkin Pie Perfection” with a pumpkin spice flavored yogurt and the addition of pecans and chocolate. Or “Caramel Apple Delight” with an apple pie flavored yogurt with granola and butterscotch chips. Hm, what do you think?